My sincerest thanks go to my friend Stephanie Y for alerting me to the existence of this book. Words fail to describe how much I enjoyed it. Like Stephanie, I would give this 4.5 stars (out of 5). Plus. "There is such humor and mischief in these pages. The characters sparkle and Sophy herself is a triumph." "Heyer's brilliant wit and intelligent humor make her work stand head and shoulders above the rest." I guffawed and chuckled and outright snorted my way through this book. Since I primarily read it in the car on a road trip, family members were (understandably) startled and sometimes alarmed with my outbursts. Think Jane Austen with added hilarity. And, like with all good chick lit, there's a delightfully happy ending. 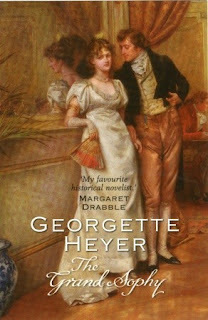 Georgette Heyer is my favorite Regency author, and The Grand Sophy is one of her best (in my opinion!). I also love Frederica, Sylvester, and Arabella. "The Grand Sophy" is a riot of a read. Heyer sketches Sophy's escapades in such a humourous and entertaining manner that we cannot help but be charmed. Cleverly plotted, possessing elegant prose and characters that are just so alive and real "The Grand Sophy" proved to be the kind of book I wish I could find and read everyday.